When it comes to clothing, I tend to bounce back and forth between synthetics and wool. Arcteryx's ultralight Motus Crew makes a strong case for the synthetic argument. First of all there is its almost-not-there weight: 3.9 ounces in a men's small, long-sleeve (measured). Then there is the Motus Crew's extremely sheer construction, which makes it exceptionally light, airy, and comfortable. 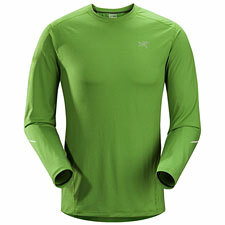 The Motus is a high-output shirt, designed for warm weather and aerobic-intensive pursuits. For me, the Motus really shines when you're climbing from hot to cold weather. The weakness of wool, even in the lightest weights, is that it just isn't comfortable when it's hot. Cotton bests all fibers in hot weather, but becomes a liability once it gets soaked and the temperature drops. Enter the Motus as a transitional garment to get you from hot to cold in comfort. If a hike starts cool or cold I'm happy to start in wool, but typically at the bottom of an Eastern Sierra approach you're going to find hot sun and warm weather no matter what time of year it is. In these conditions, what I really want from a shirt is just sun protection: I want the lightest, coolest possible shirt, so that I feel (as much as possible) as if I'm hiking without any coverage at all. Higher up, you can bet the wind will start blowing and the air will cool. Here, I want a shirt that dries quickly and becomes an asset in keeping me warm (beneath other layers). I have to say, the Motus Crew is the best shirt I've yet found in bridging this hot-cool transition. Its feel is very much reminiscent of silk: light and sheer. Seams are all extremely flat, making this a good match with a backpack. Sun protection is outstanding, with a UPF rating of 50+. The fabric has a natural stretch to it without incorporating the use of Lycra, further enhancing comfort. Yes, this is a higher-end garment with a higher price tag, but if you've been struggling to stay comfortable across wide temperature ranges, it's well worth a look.